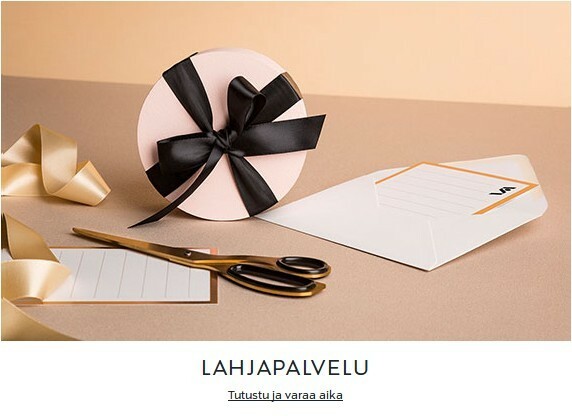 The second wishlist service that we will include in our new wishlist comparison table is the lahjalista service by Stockmann, another big Finnish department store chain. Stockmann has a premium image. Again, this in not the hottest giftlist service in the world, but it was one of the first out there 17 years ago that I considered using. And it still exist, so it must also have done something right... or just provided one more proof that wishlists in general are useful :). The wishlist/giftlist service on the Stockmann website is pretty well hidden. Unlike most wishlists, it is not accessible from the webstore. To find it, you have to select services ('Palvelut') from the main menu, then select gift services ('Lahjapalvelu'), and then finally gift list ('Lahjalista'.) The front image of Lahjapalvelu is shown on the right. Once you get this far, the page informs you that you should reserve an appointment with the customer service to create your wishlist. There is a button that opens a form where you can select the department store and book a free time slot. You can do that, or search for a list ('Etsi lahjalista') to open the old gift list page, which will allow you to register to the service online, without appointment. The registration requires your name (names for wedding), address, email, phone, event day and event type, and then you have to wait to get your password to the service within the next two days. I got mine the next morning, most likely sent manually. Adding items to the gift list requires that you go to the department store and ask for a bar code scanner from the customer service - then you walk around the store and scan the items you want to get included in your list. It is not possible to add items in the list online. Next, we will move on to check the other parts of the service. This gift list is bound very tightly to the Stockmann store, as even adding items to the list is done in the store. However, the list service is so old that there is no real integration with the store, and thus there are no skewed suggestions, either. But no point from that. How, then, does the site work with mobile devices? Stockmann has an app of its own, but the gift list functionality is not included there. So, we will need to look at how responsive the pages are. A quick check shows that the pages are usable on a mobile device, but they don't scale well or look good. There is a horizontal scroll bar that needs to be used to view the entire service. On the plus side, the service can be used with a mobile device. 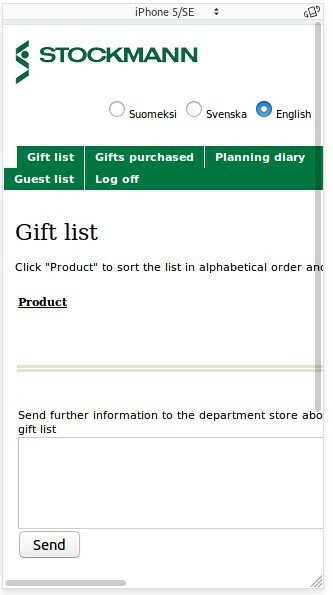 However, it doesn't qualify for a modern GUI or mobile app, as the app doesn't cover the gift list functionality. As we mentioned already, wishes can only be added from the store's selection. No point for wishes from everywhere. This wishlist doesn't offer a bookmarklet, either, as there would really be no point in doing that. The gift list page is provided in three different languages (Finnish, Swedish and English), but you cannot find the service from the website unless you understand Finnish. The store front is only in Finnish. I should not give the multilanguage check mark to this service, but I'll let it go now. After all, it does exist in several languages, and you can find the right page at least by reading this post. The Stockmann gift list only provides one login method, and that is their password. No points from multilogin. The service tracks purchases if they are done online and also offline in case the customer/invitee remembers to tell the cashier that the item is purchased from the list. Obviously, tracking is therefore not foolproof, but it exists, so a point for that. The service also offers private and public lists as the lists are not public by default and the list owner can share the login details with whomever she likes. A point for providing public and shared lists. All the wishes are visible all the time, so if you want to have an element of surprise, you will need to finish the list before you share it. If you return to it later on, you will see any purchased items at once. The list also offers no support for group purchases. No points for the surprise me functionality or for group purchases. 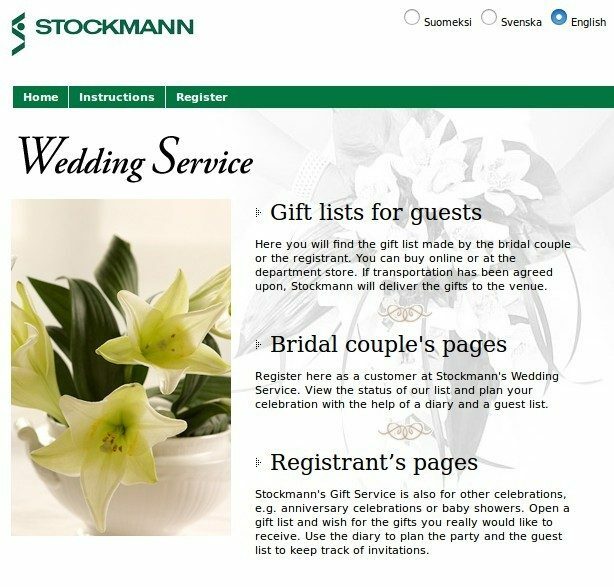 Stockmann's gift list service also offers an event planner with a task list that is bound to dates. There is a calendar view and a task list view. It is very simple and all actions need to be done manually. For example, if you send invitations (by mail or email), you will need to mark it in the list by hand that you have sent the invitations. The same goes for replies. However, it does have all the fields you need to track the process in detail. There is also a nice functionality to subscribe for a reminder email before some action that you have added in the planner. So, you can make a list e.g. for your birthday next year and have it remind you to send invitations one month earlier. This concludes our second review, of the wishlist/giftlist service offered by Stockmann. I hope you got a good idea what the service can do. In case I have missed something, please add a comment to this post, and I will look at it! and here at the bottom is one links to the instructions (in finnish) how to use giftlist service in Stockmann.